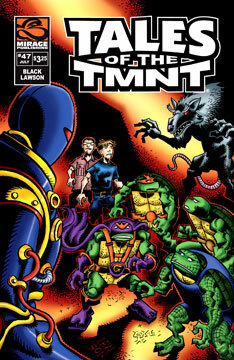 “The Secret Origins of the Super Turtles” – this issue takes us to an alternate dimension where we discover how the super hero Turtles (featured in “TMNT” Volume Four #7) came to be! Alien invaders must be stopped – can Dr. Shreddarius’ army of Terrorkinetics™ prevent certain doom – and just whose side are they on? A titanic Turtles tale featuring an epic battle between good and evil that harkens back to the stunning Silver Age of super heroes! ‘Nuff said, pilgrims! !